The secretary’s husband from Winyah Nursing Center, a facility I was working in, was acting as a fire watch for us one week when the fire alarms needed replacing. I heard him as he hurriedly came down the hallway. His experience prompted a discussion about ghostly spirits. I shared with him about what had recently been happening in our home; things which had never happened before. At some point, while working at Winyah Nursing Center, I had reconciled with my father after more than 10 years of non-communication with him. A few years later, he passed away. I noticed Christmas of that year, “strange occurrences,” began happening in my home. Because of that, I didn’t feel I had taken anything from work home with me. At first, it was just simple things like my daughter’s room became ice cold all the time, even during the summer. We’d hear phantom footsteps coming from her room to the living room. One time, my son video-taped a wire whisk hanging above the sink moving all by itself for about five minutes. While home alone at night while I worked, my husband reported hearing someone in the kitchen playing with the pots and pans. I have an open kitchen and when he turned to look, no one would be there, but when he’d call out, the noise would stop. My brother and his wife, spending a week with us, slept on the pull-out-bed in the living room. He complained almost daily about one of us walking to the front door or the refrigerator. “Is he serious?” I asked my sister-in-law about mid-week. “Yeah, y’all wake us up every night and he‘s a hard sleeper, too,” she answered. “It isn’t us,” I insisted. Naturally, we said it was my dad‘s ghost. In life, he would pace to the front door and look out then turn and go back to the fridge where he‘d open the door, shut it, and start over again a couple more times. He slept in my daughter’s room on her bottom bunk whenever he stayed with us and he loved to cook, so hearing the pots and pans meant nothing to us under the circumstances. We’d hear the glasses shake in the cabinets as if someone were stomping around in there going from one side to the other; something he often did while in the kitchen (he was very heavy footed. His footsteps were a stomping gait). My bedroom door, which was a bi-fold, would slowly open on its own. It was so slow, my husband and I just explained it away telling the kids, “The house is settling or something, so the door is going to open by itself.” But, when it started closing by itself as well, we had a harder time explaining it. “Hey! Would you get me a towel please,” I said again. After that happened to me about three times, I made sure my husband was sitting in the bedroom before I jumped into the shower again. I would sometimes lay in bed and for several seconds, I would watch a figure, like a shadow, pace across the foot of the bed then come up to my husband’s side of the bed and go back again before finally walking out the door to the living room. It became so frequent, I started asking my husband to stay in the bedroom with me some nights and watch TV until I at least fell asleep. According to my religious beliefs, I do not believe these spirits to be our long lost loved ones. The Bible teaches that when we die, we sleep. We will continue sleeping until the time of Resurrection. It also teaches us the Devil is very deceptive. He’s the inventor of lies and in attempts to deceive us, he uses trickery. He uses the spirit world and we call them ghosts. Knowing these facts, I felt sure it wasn’t my father’s spirit. Instead, I felt whatever it was, was attempting to convince me it was my dad. 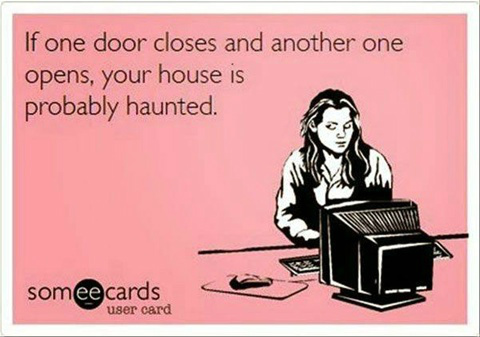 I silently endured and learned to cope with the ghostly manifestations taking place in our home. I tolerated it with nonchalance until it started making its presence unmistakenly known by making physical contact with me. I was sitting at my desk one afternoon while my son, whom I was home-schooling, did his school work. My hair was down around my shoulders, hanging a little more in the front. I felt someone come up and lovingly stroke my hair like my father used to do. I felt my hair as it was being pulled back off my shoulders. Not a strand or two, it was the whole lock of hair. We tolerated many more of these ghostly presences for about ten years before discovering they were not what they seemed which I’ve also written about. These paranormal experiences finally went away after I called my brother and then had the house blessed.